Award Winning Chili Recipe. A combination of my Kansas family chili recipe with some unique additions. In the end you’e got a beef, pork, sausage, bean chili recipe which became an award winning chili recipe in Colorado. This is what one would officially refer to as “hauling out the big guns”. I’m sharing my award winning Chili Recipe. About five years ago, I won 2nd Place with my chili recipe in a Douglas County Chili Cook-off down in Castle Rock. I had to come up with a name for it when I entered. Since it was somewhat like my Dad’s “Chili Soup” that he used to make when I was growing up, but then again nothing like my dad used to make, I decided on “Toto, I Have A Feeling We’re Not In Kansas Anymore Chili”. What makes this recipe different and delicious? You see, I’m a big Italian Sausage fan and just couldn’t resist throwing some into my family version. 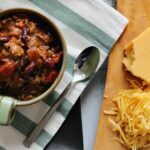 With the wonderful mix of spices in this chili recipe, it doesn’t over power and seems to blend right into the mix. The usual suspects, pinto beans are present, but I also added in kidney beans for additional texture and color. The key to any successful soup or stew recipe is good quality meat and spices and a long perking simmer. There’s always packets of chili seasoning you an buy at the store, but why not concoct your own. 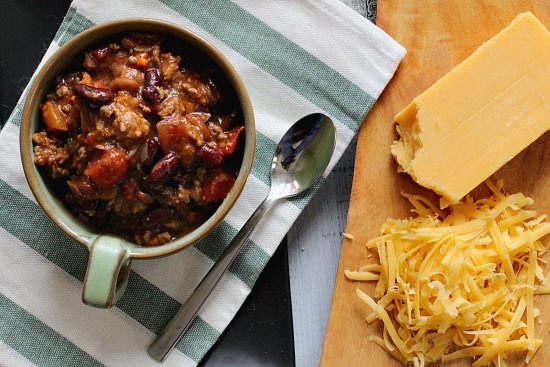 This recipe includes a great spice combination for a rich flavored bowl of chili. I’m particularly proud of adding smoked paprika. I always like a little sweet, so this recipe contains a bit of brown sugar. And then there’s some red wine. 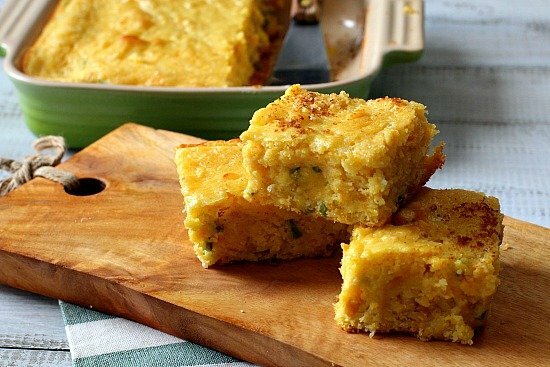 Sprinkle with some grated cheddar and chopped cilantro, and serve with warm flour tortillas, saltine crackers, or even corn chips. Dig in. And back to those spices. I can’t stress enough about quality here. I hope you’re fortunate to have a local spice shop to purchase fresh-ground ingredients. I’m lucky that I have Savory Spice Shop It’s a locally owned mom and pop operation that specializes in providing all things spice. Savory Spice Shop grinds scores of spices weekly, I practically live in that place. Always support local, but if you don’t have that option, Penzeys Spices is another option, with quality ingredients available. With that said, let’s make some championship chili. This one feeds an army. I hope you give this award winning chili recipe a try. And if you do, please come back and let me know how you liked it and give the recipe a star rating. Your feedback is valuable to me for developing future recipes. And if you have a favorite award winning chili recipe, let me know, I’d love to give it a try. The biggest reward a cook can have is hearing from fans. Heat a large dutch oven over medium high heat. Add 2 tablespoons olive oil. Add sausage, onion, sirloin, pork, jalapeno, green bell pepper and garlic. Cook 8 minutes or until sausage and beef are browned. Add chili powder and next 10 ingredients (through bay leaves) and cook 1 minute stirring constantly. Stir in wine, tomatoes and drained beans. Dissolve bouillon in water and add to chili. Add more water if necessary for consistency. Cover and cook on low for at least 1 hour, stirring occasionally. Uncover and cook on low for 30 minutes, stirring occasionally. Discard bay leaves. Serving suggestions: grated cheese, saltine crackers, flour tortillas, corn chips, fresh chopped onion, thin sliced radishes. For your preferred consistency, add a bit more water if needed, or some masa to thicken. 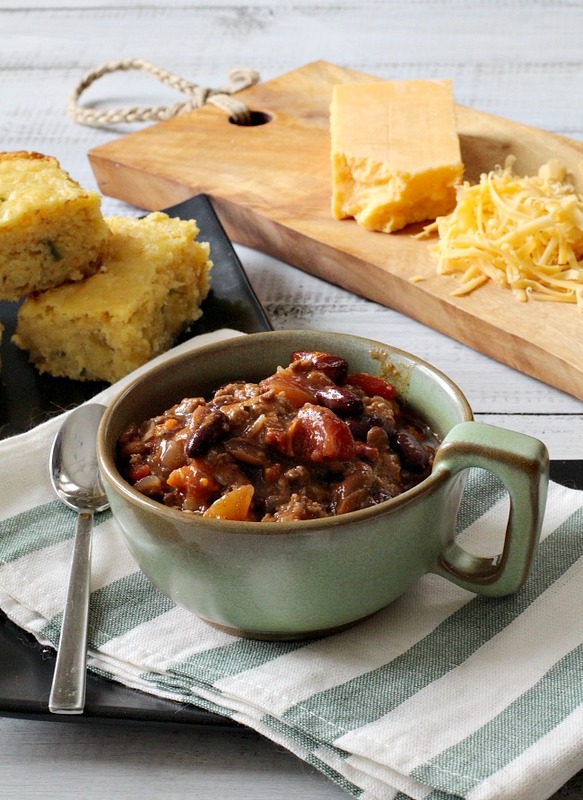 Award Winning Chili Recipe … It’s What’s for Dinner. I’m totally digging your chili recipe, how could it be bad with wine? I checked out the spice shop…love the chile selection! I checked out the spice shop and I’m intrigued by the tomato powder. Hey, new web design, I like it! 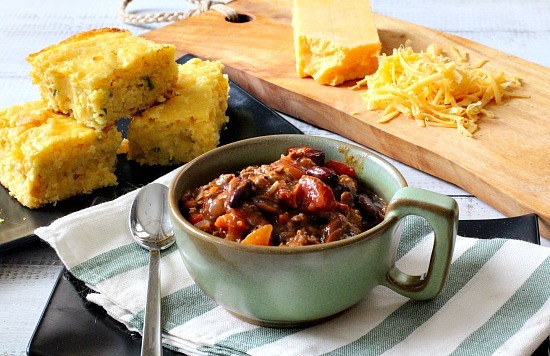 This is an awesome chili recipe; however, what about the 1 Cup of water, and the Beef Bouillon listed in the Ingredients section – but not in the instructions? Thanks for any help.